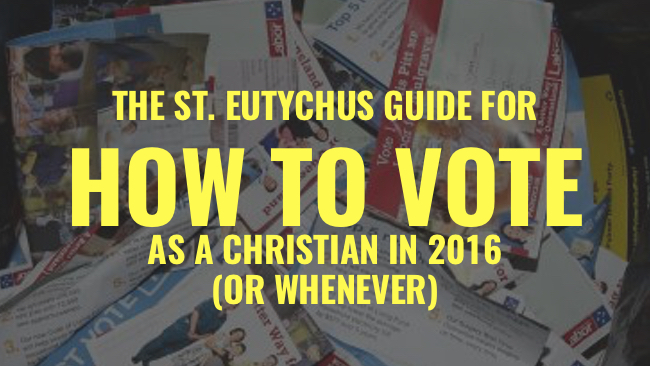 There are plenty of ‘Christian’ how to vote guides floating around the internet this week. Ranging from the sublime to the ridiculous, I’m aiming for somewhere in the moderate middle. I’m also writing this purely as an individual, not on behalf of anything or anyone. Consider these thoughts appropriately disclaimed, and take from them what you will. I’ve written my own guides and checklists in the past. Whatever happens next weekend, Australia faces stability that second world countries like England and the US can only dream of. We’re not staring down a #brexit or a Trump. Our major parties agree on most things, and they’re even pretending to disagree about certain policy ideas but promising to ‘check the costings’ after the election and adopt them if they stack up. There are good ‘Christian’ reasons for voting for just about every party on the spectrum from Family First, through the Liberal/Nationals, the Nick Xenophon Team, Labor, and the Greens. I won’t vote 1 for at least four of those parties (because that would be an invalid vote), but I’ll understand why others would, and I think our country would do better to hear voices from each of these perspectives as we figure out how government should provide a common legislative threshold for a bunch of groups who increasingly disagree with each other on what is ‘good’ for people. This is really what a liberal democracy is all about; allowing competing interests and minorities to be equally heard and catered for in our shared life as citizens. When we disenfranchise a particular minority in our community because the majority disagrees with them — when we remove some of their liberty to pursue a particular vision of the good life — we run the risk of not being a liberal democracy, but a populist democracy. A populist democracy is not built on the idea of all of us, in our various communities-within-the-community having equal freedom to work out how to live, but on the idea that the majority rules and in the majority ruling, the majority dictates what vision of human flourishing or goodness everyone else has to sign up for. As Christians we’re told to respect our governments, pray for them, to live such good lives in our world that people know we’re citizens of heaven; and at least one New Testament Christian, Erastus, who Paul commends is a part of the Roman political system an ‘aedile of the city of Corinth’. The important thing is don’t waste your vote just voting for a plebiscite. That’s dumb. And I’ll explain why in parts 2-4 of this series. In fact, I think it’s important that we don’t make our free vote a cheap vote, but that we see voting as something that flows from certain obligations we bear as citizens, and creates new ones. How to vote as a Christian in 11 steps. Step 1. Decide what issues are important to you, particularly because they affect your neighbours (and I’d say especially your neighbours in marginalized communities — the poor, the refugees, the widow, the oppressed, children). The Eternity Election Guide is a good one to know what issues are in play. Step 2. Spend some time familiarising yourself with the platforms of the parties who are fielding representatives in your electorate. Step 3. Find out about the candidates in your electorate — figure out who displays the most wisdom and character. Who will act virtuously when complex issues outside those of the campaign arise? Who listens? Who do you want representing you? Who do you feel you might be able to speak to about significant issues in your electorate and our country over the next three years? All our parties need people of wisdom and virtue. Step 4. Pray for wisdom. Pray that when crunch time comes you’ll cast your vote for the good of others, not just for yourself, and not for the leader you like best. Step 5. Walk into a polling booth with valid ID. Line up. Get your ballot papers for the Lower and Upper Houses. Do this without fear, and do it knowing that whatever the outcome you face relative social stability; which is an amazing privilege that you should thank God for. Step 6. Vote. Mark your ballot papers appropriately — don’t spoil your vote. Voting is a privilege, and is a thing you do as part of a wider network of relationships. Your vote isn’t free — it brings a bunch of responsibilities with it. Step 7. Buy a sausage on bread to support the school or church you just voted in. Celebrate the relative global and historical rarity it is to vote so freely. Step 8. Pray for the person you voted for. Pray for the people you didn’t vote for. Pray for the person who wins your electorate. Give thanks for their commitment to sacrificing their interests for the interests of others. Pray for wisdom. Step 9. Your participation in a democracy does not start and finish in an election. Spend the next three years working to build relationships with your local member and community; join a political party, speak up on issues that affect your community with wisdom and grace, and write letters (find out the difference between local, state, and federal governments and the issues they govern). Step 11. If you’re a person with some wisdom, and a desire to serve, why not get in the political business. Don’t just join a party. Seek pre-selection. Run for office? Or get a job as a public servant? Become part of the process and speak into the process from within. You’ll, of course, have to be prepared to compromise your own personal views for the sake of those who disagree with you whose job it will be for you to represent, serve, or govern for. But be like Erastus — the guy Paul mentions in Romans 16, who’s high up in the government of Corinth and a Christian.